In 2002 and 2006 (2001 and 2005 seasons), the Rose Bowl game was also the BCS National Championship Game. In the current BCS alignment, the Rose Bowl will host the designated Big Ten and Pacific-10 conference representatives unless they are involved in the national championship game. Rose Bowl game representative teams from the Big Ten and Pacific-10 conferences are chosen by the specific rules for each conference. Tiebreaker rules exist when multiple teams tie for the conference championship. Originally titled the "Tournament East-West football game," the first Rose Bowl was played on January 1, 1902, starting the tradition of New Year's Day bowl games. The inaugural game featured Fielding Yost's dominating 1901 Michigan team, representing the East, which crushed a previously 3-1-2 team from Stanford University , representing the West, by a score of 49–0 after Stanford quit in the third quarter. Michigan finished the season 11–0 and was considered the national champion. Yost had been Stanford's coach the previous year. The game was so lopsided that for the next 15 years, the Tournament of Roses officials ran chariot races, ostrich races, and other various events instead of football. But, on New Year's Day 1916 football returned to stay as The State College of Washington defeated Brown University in the first annual Rose Bowl. Before the Rose Bowl Stadium was built for the January 1, 1923 match, games were played in Pasadena's Tournament Park , approximately three miles southeast of the current Rose Bowl stadium near the campus of Caltech . Tournament Park was determined to be unsuitable for the larger and larger crowds gathering to watch the game and a new, permanent home for the game was commissioned. The Rose Bowl stadium, designed after the Yale Bowl in New Haven, then hosted the first "Rose Bowl" game in 1923. The name of the stadium was alternatively "Tournament of Roses Stadium" or "Tournament of Roses Bowl", until being settled as "Rose Bowl" before the 1923 Rose Bowl game. The stadium seating has been reconfigured several times since its original construction in 1922. For many years, the Rose Bowl stadium had the largest football stadium capacity in the United States, eventually being surpassed by Michigan Stadium in 1998. The maximum stated seating capacity was 104,594 from 1972 to 1997. Capacity was lowered following the 1998 Rose Bowl. The 2006 Rose Bowl game, which was also the BCS championship game, had a crowd of 93,986; and a crowd of 93,293 saw the 2009 Rose Bowl game. As of 2008, the Rose Bowl is number eight on the List of American football stadiums by capacity with a current official seating capacity of 92,542, and is still the largest stadium that hosts post-season bowl games. The Rose Bowl is also the only BCS bowl game that is held in a non-NFL stadium. In the game’s early years, except during World War I, the Rose Bowl always pitted a team—not necessarily the conference champion—from the Pacific Coast Conference (PCC), the predecessor of the current Pacific-10 Conference, against an opponent from the Eastern U.S. During the last two years of World War I, teams from military bases met in the Rose Bowl. During its history, a number of notable matchups have been made with the top football teams and top coaches of the time. These include the 1925 Rose Bowl, featuring Knute Rockne's Notre Dame team against “Pop” Warner’s Stanford team; the 1926 Rose Bowl, featuring Alabama Crimson Tide’s win over Washington (the first southeastern team to beat a northern team); and the 1940 Rose Bowl, featuring Howard Jones’ USC Trojans against Bob Neyland’s Tennessee Volunteers. During this period, there were ten games matching two undefeated teams. After the United States declared war on Japan on December 8, 1941, as part of the American reaction to the attack on Pearl Harbor , there were concerns about a possible Japanese attack on the West Coast. Much discussion focused on the possibility of an attack where any crowds might gather. The Rose parade with a million watchers, and the Rose Bowl with 90,000 spectators were presumed to be ideal targets for the Japanese. Lieutenant General John L. DeWitt recommended that the Rose Parade and Rose Bowl festivities be canceled. The Rose Bowl committee originally planned to cancel the game. On December 16, 1941, Duke University invited the game and Oregon State to Duke's home stadium in Durham, North Carolina . During World War II, many college football schools had dropped some conference opponents and instead played football against local military base teams. Many colleges could not even field teams due to the draft and manpower requirements. After the war was over, demobilization and the G.I. Bill enabled returning servicemen to attend college. The 1946 season was the first true post-war college football season with travel restrictions lifted and civilian college opponents returning to schedules. The Big Nine and PCC were of the same accord when it came to treating players as amateurs, as compared to the semi-professional status that the Southern Universities proposed. Also, the Big Nine and PCC both had the same attitudes towards desegregation and allowing African-Americans to play football. Many other universities were still segregated. None of the Southeastern Conference schools had an African American athlete until 1966. The Cotton Bowl, Orange Bowl, and Sugar Bowl would not be integrated until 1948, 1955, and 1956 respectively. The Big Nine agreed, after eight years of negotiating over payments, rules, and ticket allocations to a five-year exclusive deal with the Rose Bowl to send the conference champion to meet the PCC conference champion. UCLA, USC, Minnesota and Illinois all voted against it. Beginning with the 1947 Rose Bowl game, the game's participants were established as the champions of what is now the Big Ten Conference and the PCC. When the PCC dissolved in 1959 following a pay-for-play scandal, there was no official agreement in force. The Tournament of Roses invited the ex-PCC champion to play the Big Ten champion to the 1960 Rose Bowl. The Big Ten authorized its members to accept any Rose Bowl invitation at their discretion. The Athletic Association of Western Universities signed an agreement with the Rose Bowl that remained in force from the 1961 Rose Bowl onwards. Ohio State exercised this discretion and held the Buckeyes from the 1962 Rose Bowl. The Big Ten later again signed an agreement with the Rose Bowl. The AAWU later became known as the Pacific 8, and eventually the Pacific 10 conference. Both conferences had a "no repeat" rule in force for a number of years. Under this rule, any team that had appeared in the Rose Bowl game the previous season could not go again, even if they were the conference champion. The Big Ten abolished this rule in 1972. Both conferences also had exclusive agreements with the Rose Bowl game, so that teams from the Pac-10 and Big Ten could not play in any other bowl games. This rule ended before the 1975 college football season, when Michigan was invited to the 1976 Orange Bowl and USC was invited to the 1975 Liberty Bowl. The Rose Bowl with the banner for the Rose Bowl Game. Since 1998, with the creation of the Bowl Championship Series, team selection for the Rose Bowl is now tied to the other three BCS bowls, although in any given year the Rose Bowl still attempts, if possible, to maintain the traditional Pac-10 versus Big Ten format. Twice in this era, the Rose Bowl has served as the BCS championship game. The 2002 game served as the BCS championship game between the BCS #1 ranked Miami, then a member of the Big East Conference, and the BCS #2 ranked Nebraska of the Big 12 Conference. The Nebraska selection as the BCS #2 team was controversial because Oregon was ranked #2 in both the AP and Coaches Polls, while Nebraska was ranked #4 in both polls and did not play in its conference championship game (#3 Colorado, who played Oregon in that year's Fiesta Bowl, did and won the Big 12's automatic bid to the BCS). This prevented a West Coast team playing in the Rose Bowl for the first time, and it also marked the first match up since 1946 to not feature the traditional pairing of Pac-10 vs. Big Ten teams. The 2006 Rose Bowl game featured offensive powerhouses Texas, riding a 19-game winning streak, and USC, which entered the game with a 34-game winning streak and 2 Heisman Trophy winners. Texas won 41–38. The game's television viewership was the highest for college football contest since the 1987 Fiesta Bowl between Penn State and Miami. On two other occasions during the BCS era, Rose Bowl participation has expanded beyond the Big Ten and Pac-10. The 2003 game featured the first appearance by Oklahoma, who was chosen for the game over Big Ten co-champion Iowa (Ohio State, who had shared the conference championship with Iowa, played for the national championship and won). The 2005 game featured Texas of the Big 12 Conference, selected, amid some controversy, over the University of California at Berkeley of the Pac-10, marking the second time a West Coast team did not make the Rose Bowl. The University of California at Berkeley has had the longest drought not appearing in a Rose Bowl since January 1, 1959; not winning the Rose Bowl since January 1, 1938. The 2004 game is also noteworthy. In this game, USC defeated Michigan, 28–14, thus earning the top ranking in the AP Poll and a share of the national championship with BCS champion LSU (USC, despite being #1 in both the Coaches' and AP polls, did not qualify for the BCS championship game because of their standing in the BCS system). Beginning with the 2011 Rose Bowl though the 2014 Rose Bowl, the qualifying system for the Rose Bowl will change. The Big Ten and Pac-10 champions are still contractually obligated to play in the game and will unless one of those two teams is to play in the BCS National Championship Game. The first time this happens, should it happen, the other automatic bid must go to one of the champions of the non-BCS conferences, provided that one of those team is able to meet the criteria the BCS has set for these schools. Should one of those teams fail to qualify for the BCS either the Big East champion, a BCS conference at-large team, or Notre Dame would take the bid. For many years the Rose Bowl eschewed sponsorship, but for the 1999 Rose Bowl, the game became known as The Rose Bowl Game presented by AT&T. Unlike the other bowl games, the sponsor was not added to the title of the game, but instead as a presenter. In 2002 it was branded The Rose Bowl Game presented by PlayStation 2. Since 2003, when the agreement with Sony expired, the game has been presented by Citi. From 1952 to 1988, the Rose Bowl was televised by NBC in a 1 p.m. PST time slot, the only New Year's bowl airing at that time. The 1962 Rose Bowl was the first college football game broadcast in color. Since 1989, it has been broadcast on ABC, usually at 2 p.m. PST. While FOX has secured the broadcasting rights to the other Bowl Championship Series games, the Rose Bowl, which negotiates its own television contracts independent of the BCS, has agreed to keep the game on ABC. The 2005 Rose Bowl was the first one broadcast in HDTV. After the 2009-10 season, ESPN will have the contract to broadcast the BCS games, including the Rose Bowl game. USC has played the most times in the Rose Bowl, with 33 appearances, followed by Michigan (20), Washington (14), and Ohio State (13). Alabama, 4-1-1 in Rose Bowls, has made the most appearances of any team outside the Pac-10 and Big Ten conferences, and even references the game in its fight song. USC has won the most Rose Bowls (24), followed by Michigan (8), Washington (7), and Ohio State (6). Michigan has lost the most (12), followed by USC (9), UCLA and Ohio State (7 each). Of teams appearing at the Rose Bowl at least 4 times, Michigan St. has the greatest winning percentage (0.75), followed by USC (0.73), Alabama (0.67), and Illinois (0.60). The most frequent Rose Bowl matchup is USC-Michigan, occurring for the eighth time in 2007, with USC holding a 6–2 advantage. (Including rare meetings outside the Rose Bowl, USC leads this series 6–4.) The next most frequent matchup is USC-Ohio State, occurring for the seventh time in 1985, with USC holding a 4–3 advantage. Also of note, during this era Big Ten and Pac-8 teams could play only in the Rose Bowl; this restriction was not lifted until the 1975 season. Archie Griffin of Ohio State and Brian Cushing of USC are the only players to ever start in four Rose Bowl games. Legendary coach Woody Hayes led Ohio State to the Rose Bowl from 1973–1976, while USC head coach Pete Carroll led the Trojans to the Rose Bowl from 2006-2009. The only current member of the Pac-10 or the Big Ten never to have appeared in the Rose Bowl is Arizona. Idaho and Montana, who were members of the Pacific Coast Conference from 1922 until 1958 and 1950 respectively, never finished near the top in the PCC football standings. The Rose Bowl was exclusively a Big Ten-Pac-10 affair for 52 years, from 1946 (1947 Rose Bowl) through 1997 (1998 Rose Bowl). While the Big Ten dominated the game in the late 1940s and 1950s, and the Pac-10 dominated during the 1970s and early 1980s, over the entire 52-year span, each conference won 26 games. The BCS era now covers the past eleven games, starting with the 1999 Rose Bowl. Since then, of the seven games featuring a Big Ten-Pac-10 matchup, the Pac-10 leads in wins, 5-2, with Wisconsin winning for the Big Ten in the 1999 and 2000 Rose Bowls (Big Ten has not won since). However, the 2007 Rose Bowl and 2008 Rose Bowl, each Big Ten losses to the Pac-10, actually featured the Big Ten runner-up, as conference champion Ohio State was selected to play each of those years in the BCS National Championship Game. In 1918 and 1919 the Rose Bowl hosted football games between military institutions. Years listed below indicate the January game date; for example, the 2007 game was played following the 2006 football season. Winners listed first, to left of table. Italics denote a tie game. ** Following the attack on Pearl Harbor , the 1942 game was moved to Duke University's Wallace Wade Stadium in Durham, North Carolina , as officials were wary of allowing such a large crowd to congregate anywhere on the West Coast due to World War II security concerns. The most valuable player in the Rose Bowl game is given a crystal trophy that is the Rose Bowl Player of the Game Award. The award was created in 1953 and awarded retroactively for players all the way back to the 1902 Rose Bowl. Occasionally, the award has been shared by two players. Beginning with the 2005 Rose Bowl Game, the Rose Bowl Player of the Game Award has been given to both offensive and defensive players of the game. Beginning with the 1947 Rose Bowl, the Pacific Coast representative was the home team, and the Big Nine representative was with visiting team. This arrangement would alternate each year. The stadium seating started with the Big Nine representatives in the end zone, but eventually was set with the Big Ten fans and team on the West (press box) side, and Pacific-10 fans and team on the East side. The home team wears their home jerseys, and the visiting team wears the visiting jerseys. There have been exceptions. UCLA wore their home jerseys in the 1962, 1966, and 1976 Rose Bowl games. From 1947 through 2001, the Big Ten team was the home team in even-numbered years, and the Pac-10 team was the home team in odd-numbered years. In 2003, Washington State was the home team, as a non-Big 10 or Pac-10 school (Oklahoma of the Big 12) was the opponent; the same applied in 2005, when Michigan played another Big 12 school, Texas. Beginning with the 2002 Rose Bowl, Nebraska was the home team and fans and team were on the East sideline. Since 2006, the home team has been the team with the highest BCS season ending ranking. For the 2005 Rose Bowl, the Michigan team was on the East sideline, Texas was the visiting team and was on the West sideline. For the 2006 Rose Bowl, USC was the home team and Texas was the visiting team on the West sideline. Traditionallly, the Big Ten (or its BCS replacement) is on the West side (press box) and the Pac-10 team is on the East side. The institution with the highest BCS ranking performs the national anthem, and performs first at halftime. Except in BCS championship years, the National Anthem is performed by the band. In BCS Championship years, a performer has been invited to sing the Anthem, the last being Le Ann Rimes in 2006. The Rose Bowl does not have other performers during the halftime show besides the school marching bands. As part of the television contract, a portion of each band's halftime performance is shown on television. Each school and each conference are allocated television spots to advertise. Huge Flagstaff For Pasadena. Enormous Steel Pole 122 and ½ Feet Long Will Stand in Rose Bowl. Los Angeles Times, December 10, 1922. 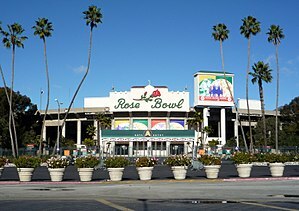 Monday afternoon at 2 o'clock the new flagstaff of the Tournament of Roses stadium, now called the Rose Bowl, will be put in place with suitable ceremony under auspices of the Pasadena Lions Club, donor of the pole. Tournament of Roses Parade FAQs. In 2006, attendance was 93,986. Zimmerman, Paul - Duke Likely to Play Beavers in Durham. Blue Devils Invite Foes Rose Bowl, Shrine Grid Games Halted as Other Sports Events in Balance. Los Angeles Times, December 15, 1941. Zimmerman, Paul - Scene of Rose Bowl Shifted to Durham, N.C. Los Angeles Times, December 16, 1941. Perpetuation of the annual Rose Bowl intersectional football, classic was assured yesterday when the Tournament of Roses officials and Oregon State College accepted the hospitality of Duke University. Michael Oriard - King Football: Sport and Spectacle in the Golden Age of Radio & Newsreels, Movies & Magazines, The Weekly & The Daily Press. Published 2004 UNC Press. ISBN 0807855456 Chapter 3:Who cares about reform? 2008 Rose Bowl Program, 2008 Rose Bowl. Accessed 26 January 2008.